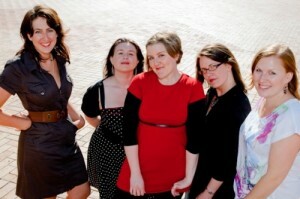 The Improv Divas are back! NZ’s leading ladies of improv are ready to rock the capital with an all new, all improvised show in 2010’s International Comedy Festival. Produced and performed by an all-female ensemble cast from Wellington Improvisation Troupe (WIT), The Improv Divas will lead you through an hour of humour, honesty and hilarity, telling stories made up on the spot based on audience suggestion and whatever the ever-present wind blows in. This year’s cast are a travelled and acclaimed bunch. Returning to the Divas stage are: Christine Brooks, creative director of WIT, recently seen in WIT’s ever-popular soap, The Young and the Witless and NZ Fringe show Gods and Heroes; Merrilee McCoy, last seen presenting and performing in NZ’s international Improv Festival and WIT’s acclaimed season of The Wishing Tree, and Jen Mason who last year trained and performed with the Spontaneity Shop, a London-based improv company and joined Merrilee in The Wishing Tree. As for the new additions to Improv Divas, improvisor/stand up Chelsea Hughes hails from Texas, USA, and while Karen Anslow might be their most local talent, what a talent she is, co-creating the “especially excellent homegrown work” Becoming the Courtesan in 2009. Join The Improv Divas, New Zealand’s only all-female all-improvised comedy act, for an entertaining evening of on-the-spot storytelling. “a welcome balance where the female energy is on a slow burn that really delivers” – Patrick Davies, Theatreview. This entry was posted in Improv Divas, past shows and tagged comedy, Divas, improv, Improv Angels, improvatisation on May 11, 2010 by MaDmin.